- upper dress-mantle with long flared sleeves and wide skirt. The dress is decorated with beautiful trim. 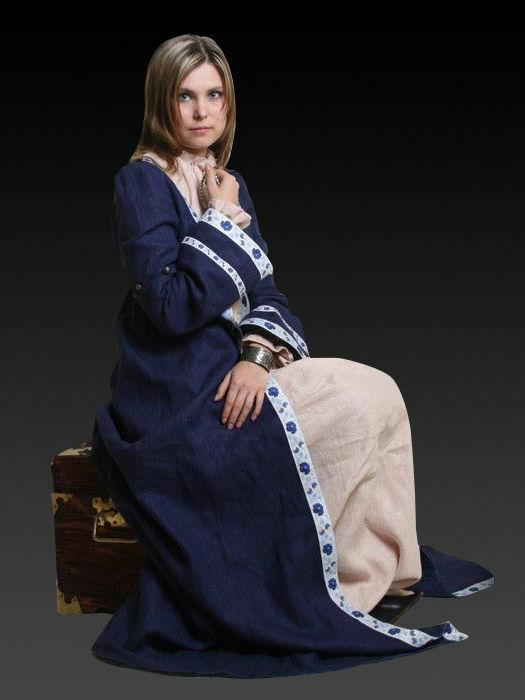 Tunic in medieval Europe was always worn as the outer garment, so you'll never see a man is worn only the undershirt on the engravings (only the peasants). This tunic with sleeves up to the elbow is very comfortable and go well together with the undershirt. We can make this tunic of linen, cotton or wool in different colours. ..
Cotta, a part of fantasy-style costume "Dwarf"
Sleeveless cotta is decorated with a trim and lacing on the both sides. It is being fastened with buttons to the level of waist. Combined with shirt and pants, cotta perfectly creates an unique dwarf character. By your wish, cotta can be made in any colour of such materials: linen, cotton, wool, silk, velvet. .. The short shirt is a part of costume of warrior, fantasy-styled character. 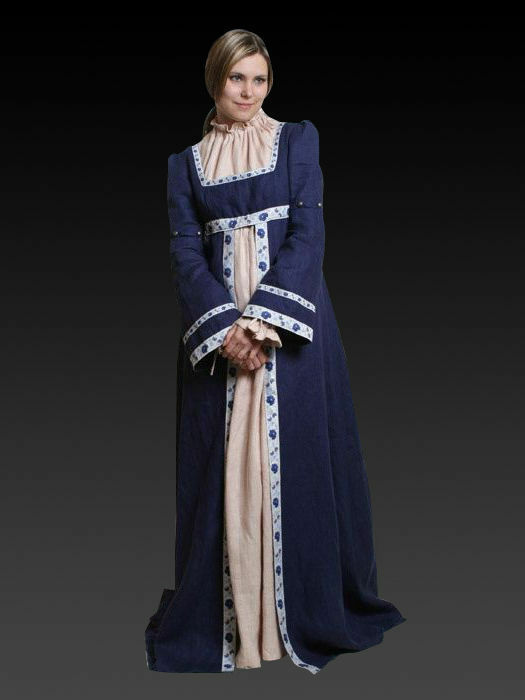 It has round neck-hole with neckline, that is decorated with a trim. To make a complete character, you can combine the same-colour pants and sleeveless cotta together with this shirt. You can order this item in any colour, and is made of the next material: linen, cotton, wool, silk. The belt is not included to the price. .. Soldiers of XII-XIII centuries were wearing such outfit. As they were not professional warriors, their main aim was assistance to the knights in everyday life and during campaigns. Costume consists of: -braies -chemise -chausses -cotta -padded cap -padded mittens -gambeson Chausses are being cut on the bias, that allows to make them rather tight on the legs. There are leather string on the top of the chausses, with what you can fasten chausses to the holes in braies or to the fabric belt. Cotta is decorated with material strips on the bottom-hem and sleeves. Simple cut is typical for XII-XIII centuries. Long cut on the neckline of cotta is laced with leather string. Sleeveless gambeson is the important part of soldier's appearance, despite of the weak safety. Padded cap is used as liner for helmet and protect your head perfectly. Cuts on the palms of the padded mittens are made for better hold. Mittens protect your arms well during medieval fencing. Base material is 100% natural cotton. .. There is typical costume of archer XIV-XV centuries, consisting of: -braies -chemise -cotta -chausses -gambeson -cap with pelerine Undershirt - chemise - is being worn under the tunic or cotta. Long chausses have leather string on the top of the chausses, with what you can fasten chausses to the holes in braies or to the fabric belt. Long cotta with V-type neckline is decorated with material straps on the bottom hem and sleeves. Gambeson with festoons on the edge was being used by archers or warriors, who did not take a participation in combats. It can be worn over the chainmail or under it. Leather string on the neckline is used for fastening. Padded cap with pelerine is being used as a liner for helmet. Base material is 100% natural cotton. For padding we use sheet-wadding (50% wool, 50% cotton). ..